Megadeth will part with decades of tour memorabilia during an online event next month, "Megadeth - The Countdown To Extinction Auction." From December 1-7, the band are teaming up with Backstage Auctions to provide an opportunity for fans and collectors around the world to own an authentic piece of memorabilia from the rock veterans. "It simply doesn't get any more real and authentic than this,” says Backstage Auctions founder Jacques van Gool, “especially with the collection coming directly from Megadeth." The auction will feature original stage back drops, flight and wardrobe cases, amps, cabinets, gear, picks and strings, apparel, set lists, lyrics, tour programs, ephemera, signed items and a whole lot more – including guitars. “The selection of guitars in this auction is what Dave Mustaine and Megadeth fans could have only hoped for and dreamed of,” explains van Gool. "Dave has been very generous with the instruments that he has decided to make available to the fans and collectors. He wants to make sure that his personal items end up with his fans, who will treasure them as he has." In addition to two double-neck 12- and 6-string V guitars, there is a host of highly recognizable signature model guitars, including the "Angel Of Deth," "Fear" and "Gears Of War", as well as the equally infamous black and silver V guitars. The online auction starts December 1 and will run through December 7. A special VIP All Access preview of the entire auction catalog will be available online beginning Saturday, November 22 and is open to fans and collectors worldwide. 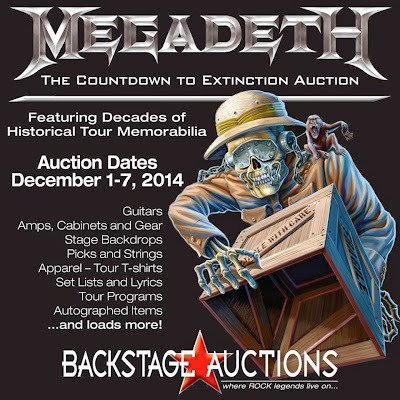 For more information and to register for a VIP All Access Pass for the Megadeth auction event, visit www.backstageauctions.com.